Applications module Application menu / Compare with entry of application history Select entry / Click on "OK"
Processes module Process menu / Compare with entry of process history Select entry / Click on "OK"
Design module Layout menu / Compare with entry of layout history Select entry / Click on "OK"
Applications module File menu / Import application Select file / Click on "Next" Import / Select an object / Click on "Version management"
Processes module File menu / Import process Select file / Click on "Next" Import / Select an object / Click on "Version management"
Design module File menu / Import layout Select file / Click on "Next" Import / Select an object / Click on "Version management"
The path of the modified file relative to the portal directory internal/application/store/<Application GUID> is shown here. Opens a dialog where the differences can be viewed in the diff format from Git. The file from the selected entry will be compared with the file from the previous entry in the external tool. The external tool is only used for viewing. Changes made to the files will not be applied. This submenu is only available if the expert options have been activated. Furthermore, the state which should be compared needs to be open in the Portal Manager. 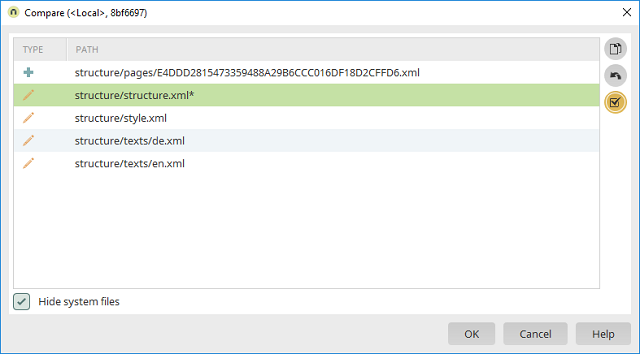 Changes to the selected files can be merged interactively between the currently opened version and the selected history entry. The changes will be applied to the currently opened version. Changed files will be marked in the list with a *. The selected file will be compared in the external tool using the two-window view. Only changes to files from the currently opened version in the local working directory can be applied. Possible changes in the history (in the version selected for comparison) will not be applied. The action allows you to directly edit files and should therefore only be performed by users with the required specialized knowledge. All changes in this area are carried out under own responsibility. Support cannot be provided for the editing of files and the resulting consequences. With this action, changes to the selected files can be completely reset from the currently opened version to a different, selected history entry. The changes will be applied to the currently opened version. Changed files will be marked in the list with a *. This action is only available if the expert options have been activated. Furthermore, the version which should be compared needs to be open in the Portal Manager. Only changes to files from the currently opened version in the local working directory can be applied. Possible changes in the history (in the version selected for comparison) will not be applied. The action allows you to directly edit files and should therefore only be performed by users with the required specialized knowledge. All changes in this area are carried out under own respsonsibility. Support cannot be provided for the editing of files and the resulting consequences. Opens a dialog where the files from applications, processes and layouts can be validated. Changes to files may not be compatible with the patch level of the current portal. Please note: The patch level of individual files cannot be modified and may cause errors. This option filters the table. System files are files that are normally generated automatically by the system, e.g. when creating a new application or when publishing an existing one.